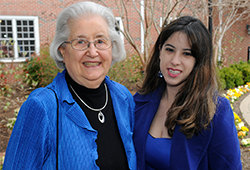 For thirty years, Elizabeth "Betty" Fischer Gore '49 has supported scholarship students at Mary Washington. She says she enjoys meeting student recipients at the annual Donor Appreciation Luncheon and receiving letters and notes about their successes at Mary Washington and beyond. Betty created the Martha Fischer Leighton '47 Memorial Scholarship in 1987 to support students from Virginia with financial need. "I did this in memory of my sister, Martha, who died from acute leukemia just two years after her graduation," says Betty. "When we attended Mary Washington, it was right after World War II. We didn't have a car then, so we took the bus or the train from Alexandria to campus, and then back home for visits. Money was tight, but things were also cheaper." Betty majored in art and taught school in Fairfax and Charlottesville before her husband's career as a physician with the United States Public Health Service put them on a path to frequent travel. When they settled back in Fairfax, she worked as a docent for 14 years at the Hirshhorn Museum and Sculpture Garden in Washington, D.C., and for 17 years at the Robert E. Lee Boyhood Home in Alexandria. "These two positions furthered my interest in art and history and allowed for plenty of time with my four children and six grandchildren." 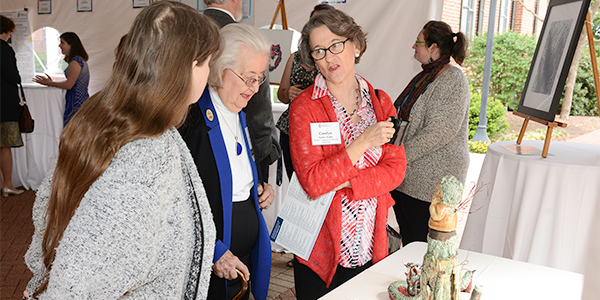 Elizabeth "Betty" Fischer Gore '49 (center) and her daughter Carolyn Gore-Ashe view exhibits in the Student Showcase at the 2017 Donor Appreciation Luncheon. As a member of the Heritage Society, Betty has made arrangements to increase the endowment for the Martha Fischer Leighton '47 Memorial Scholarship. "One of my recipients had the scholarship for three years, and she went on to attend law school," says Betty. "I want recipients to continue to receive awards that truly make a difference in their education and in their lives."